Find out whether your business should be using social media marketing or email marketing. Social media marketing may seem like the future, but email marketing is often a tried and true approach. You’ll discover the advantages and disadvantages of social media marketing and email marketing. You’ll also discover tips for focusing on elements such as audience size, audience targeting, and privacy regulations. Platforms like Facebook and Instagram offer your business the chance to connect with very large audiences. 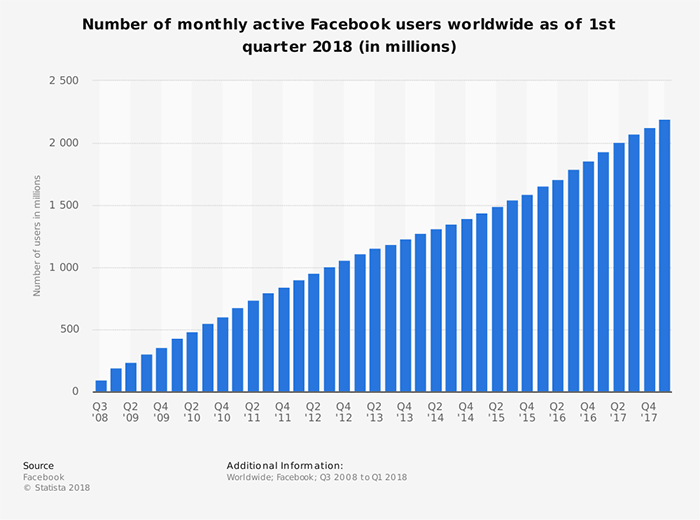 Facebook currently has an audience of 2.19 billion people, and Instagram recently celebrated a milestone of 1 billion active users. In the chart below, you can see how quickly Facebook has grown since 2008. Its growth pattern is still rising. 1. You can expand your reach and grow your audience. Social media platforms offer the opportunity to connect with new people every day, without having to ask for their permission. This happens when your followers like, share, or comment on your content and all of their friends see it. It also happens when you purchase paid advertisements. 2. You can connect with your audience multiple times a day — without annoying them. Imagine a company starts emailing you 5 times a day. How long would it take before you hit the “unsubscribe” button? Social media has the advantage when it comes to forming a relationship with the people in your audience. You’re able to post multiple times a day as long as your content is compelling and your followers like to engage with it. Unlike with email, readers don’t have to click a button to see your content because they get to preview it in their feed. 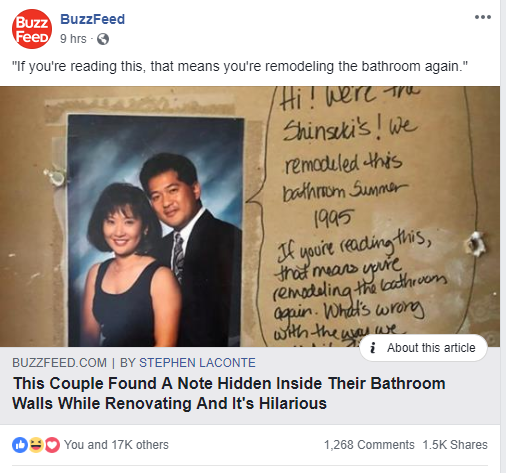 For example, Buzzfeed News posts once or twice an hour all day long, balancing a mix of news, humor, and feel-good stories. The image below shows one of the feel-good stories published to its Facebook page. Whether you post once a day or 30 times a day, your followers have a chance to preview your material before choosing whether to read it or not. 3. You get an immense amount of detail about your audience’s behavior and interests — without having to worry about security or privacy permissions. Most social media platforms collect data about the people in your audience every time they sign on. Nearly all of those platforms share that information with you, usually for free, through their analytics programs. Since the social media platforms are the ones doing the data-collecting, it’s their responsibility to inform users and adhere to privacy and security laws. With email marketing, you must ask readers for the information directly. Whereas social media gets their information from the interactions people have with friends. 4. You can publish content to a highly specific portion of your audience. There’s a lot of segmenting you can do to tailor messages to specific groups of people within your email database, especially with the right tools. But none of it compares to the massive selection of demographics offered on platforms like Facebook and Instagram. Targeting customers through social media means you’re often working with the best tools available for targeting specific types of customers. For example, in Facebook Ads Manager, you can define the audience that will see your ads. Social media has many advantages over email marketing, but it also has downsides. If you say the wrong thing at the wrong time, it can have a devastating effect on your business. It can get expensive when you add in the costs of social management tools and paid advertising. It often takes an entire creative team to produce quality content on a consistent basis. The number of users on a platform can be deceiving. For instance, one Statistica report claims there are as many as 3.1 million U.S. Facebook users under the age of 12. Facebook technically does not allow users below the age of 12. In a separate publication, Zephoria reported 83 million fake profiles on Facebook. If your goal is to grow your audience and expand your brand’s reach, then social media marketing is a good choice. Email marketing allows brands the chance to convert leads to sales by nurturing relationships more directly. 1. You can create segmented lists and remarket to customers. With email marketing, your content doesn’t go out to a general audience. You’re able to segment your subscribers according to how they interacted with your brand. For example, you can create emails for people who’ve purchased specific products from you in the past and let them know about an upgrade or related product. Or, you can ask people what kind of information they’d like to receive and email personalized content to them. 2. You can run A/B testing to find out what type of messaging works best. By observing carefully, you can discover what type of content best connects with your leads. 3. You can’t beat the ROI of email marketing. Year after year, email marketing continues to deliver a shockingly-high return on investment for businesses. According to studies by DMA and Demand Metric, the average return on investment (ROI) for email marketing is 122%, which is more than 4 times higher than other marketing formats including social media, direct mail, and paid search. How to write headlines and messages in a way that doesn’t make email providers think you’re a spammer. Certain words and phrases tip providers off to the possibility that your messages may be spam, even though people subscribed to your list. How to write compelling headlines. On social media, people preview your entire message and image/video before they decide to read it. In email marketing, though, you have only one headline to convince readers to open your message. How to create lists and segment marketing for different groups of subscribers. How to use an email platform for design, segmenting, signup forms, and publishing. How to abide by email security and privacy regulations. Email marketers are required to comply with current privacy and data collection laws that carry steep fines if you don’t get it right. While email is less expensive than social media marketing, it does require training to ensure that emails get seen and published while following all related laws. According to Smart Insights, email marketing is the #1 choice for marketers, but only by a margin of 1%. Social media marketing, content marketing, and SEO are also listed as top marketer preferences. 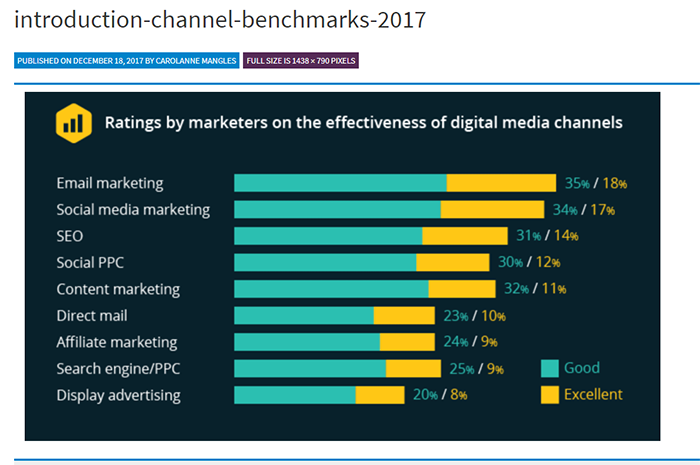 In the chart below, you’ll notice that 35% of marketers rated email marketing as the most effective digital media channel. 34% claim social media is best, and 32% say content marketing is #1. Clearly, there are different reasons people why businesses use email vs. social media marketing. Ideally, marketers should use social media to grow their audience and encourage fans to become email subscribers. Then, email marketing nurtures those leads into paying customers. If you have to choose between email or social marketing, then make your choice based on your brand’s goals. Social media marketing is better when your goal is to expand your reach and engagement. Email marketing is better at driving sales. This article was originally published on The Manifest on September 6th, 2018 and was written by Rhonda Bradley.